The morning of our second full day at San Ignacio Lagoon brought the best dolphin encounter of the trip. 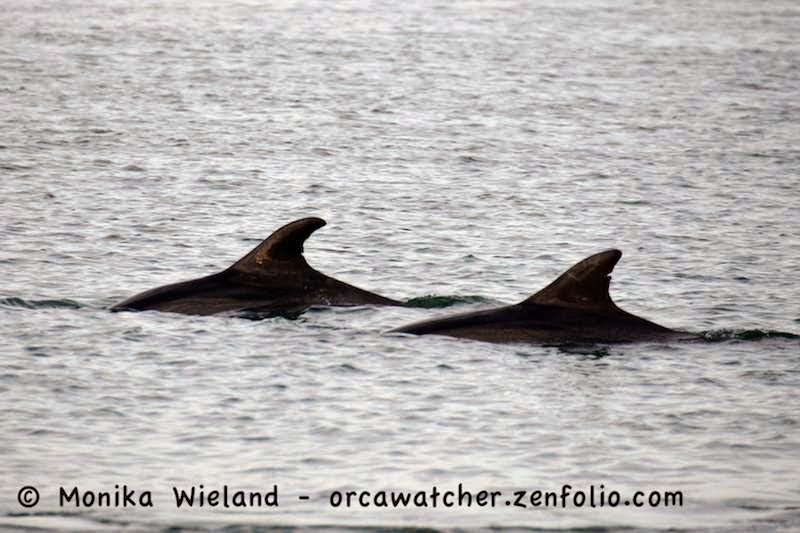 Each morning bottlenose dolphins could be found foraging off the point, and on this day there were about 40 of them in calm waters. 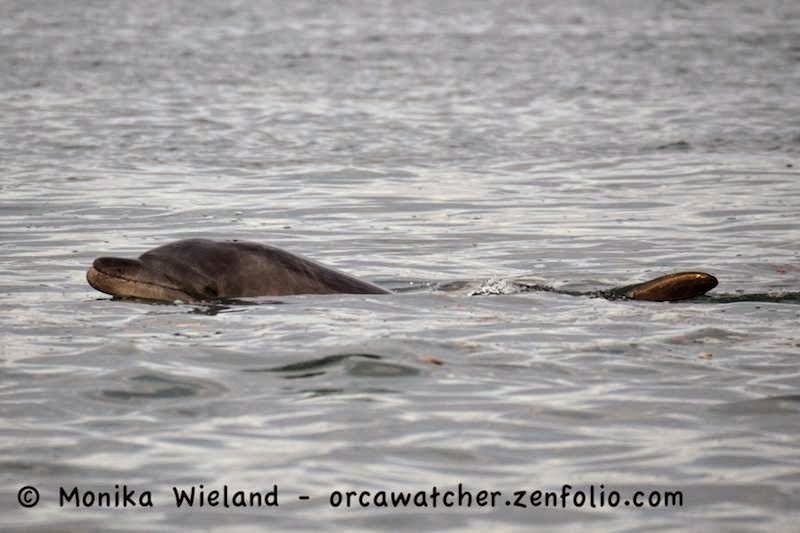 In addition to getting my first hydrophone recording of cetaceans, I took tons of photos. Nobody seems to know exactly how many dolphins live in the lagoon, but they are seen there year-round so are thought to be a resident population. I asked several of the pangeros, and they estimate there's 100-200. 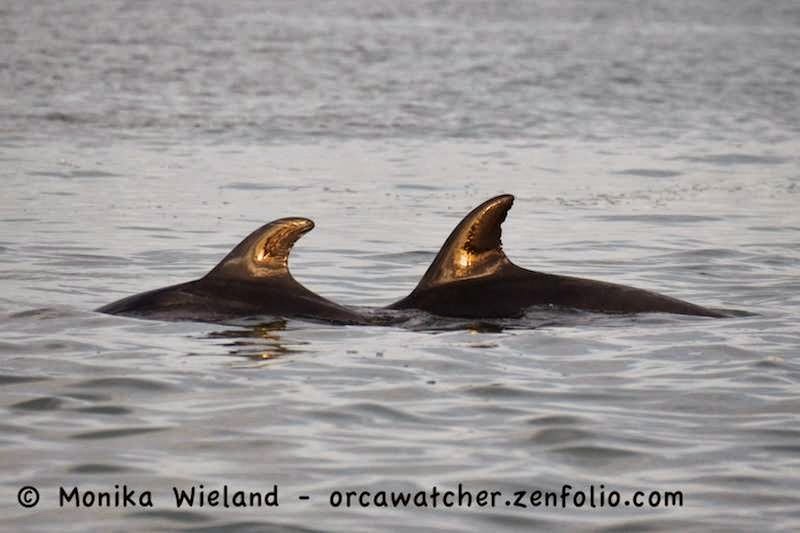 I'm sure it would be possible to conduct a photo ID study given enough time, because the dorsal fins on each one are very unique, with lots of notches and scars. I thought this one, who cruised by with his eye just above the surface, might be looking at me on shore. But when I looked closer at my photo, I realized his eye was closed the whole time - I guess not! Maybe just basking in the sunrise? 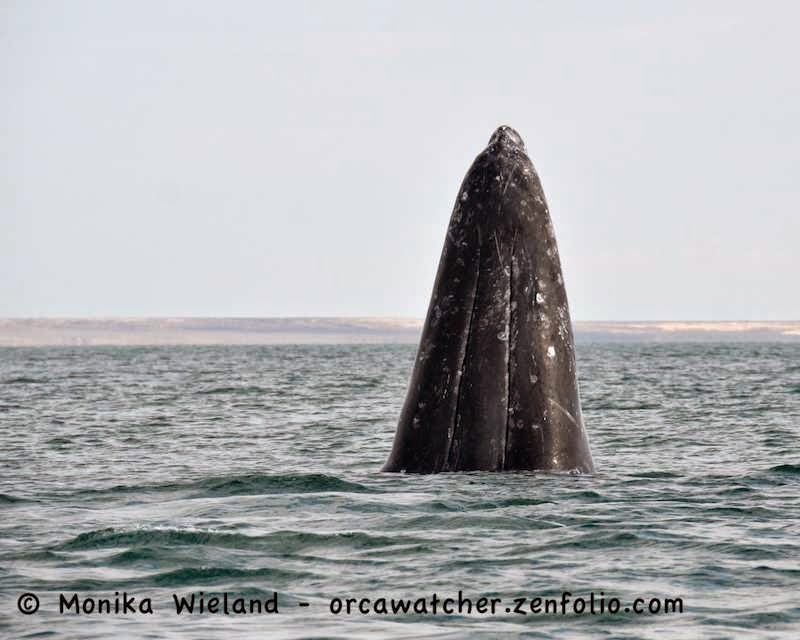 It got even better than that, though, when a gray whale breached several times in the background! 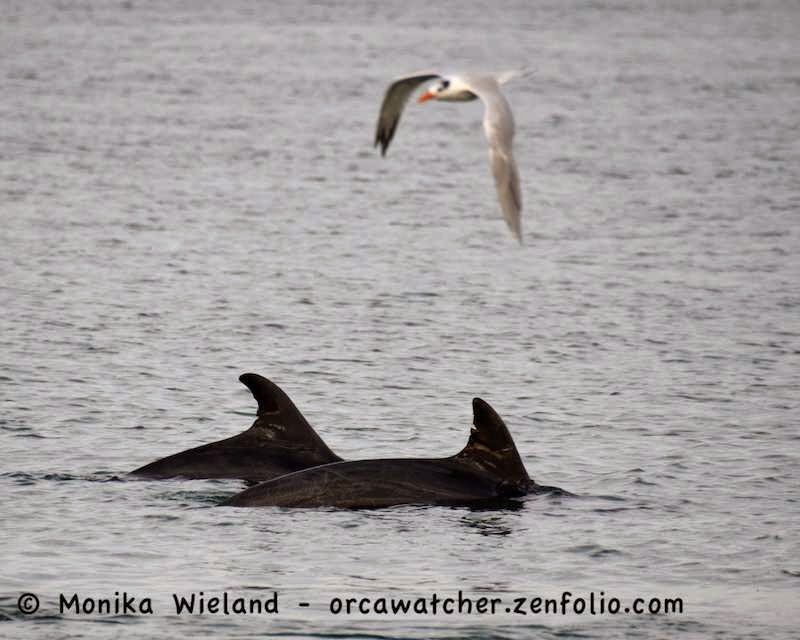 Bottlenose dolphins and a breaching gray whale! 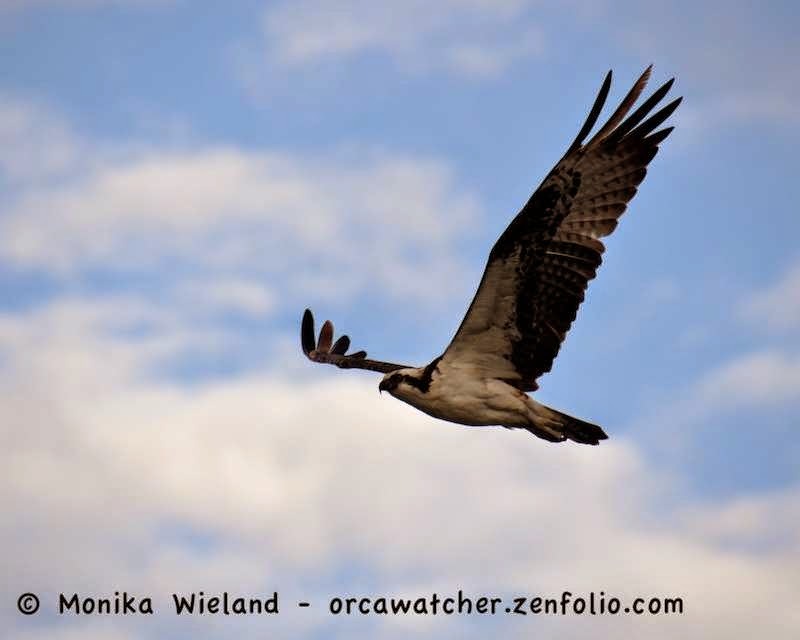 Right before it was time for breakfast, an osprey flew overhead. With no bald eagles to compete with, there are a lot more of these "fish hawks" down in Mexico than up on San Juan Island. On our morning whale watch, we didn't have to go far from camp at all. 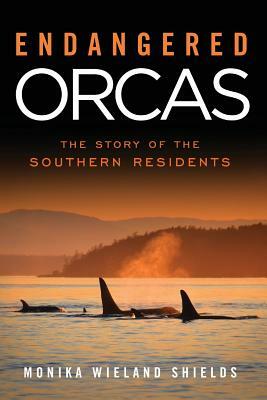 About one-third of the lagoon is open to whale-watching, while the inner portions are a whale reserve. The camp at Punta Piedra is right on the edge of the whale-watching region - you can see our tents on the point behind this whale's tail! When migrating, gray whales pretty much just swim along, but in the lagoon, we got to see the whole variety of whale behaviors, such as spyhops. Check out those throat grooves! 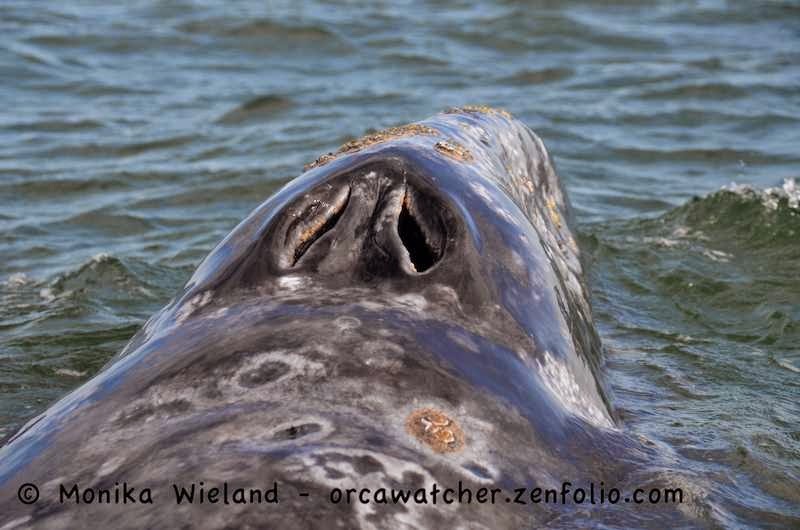 When I commented that I had never seen gray whales tail slap, it didn't take long for me to see that behavior, too! 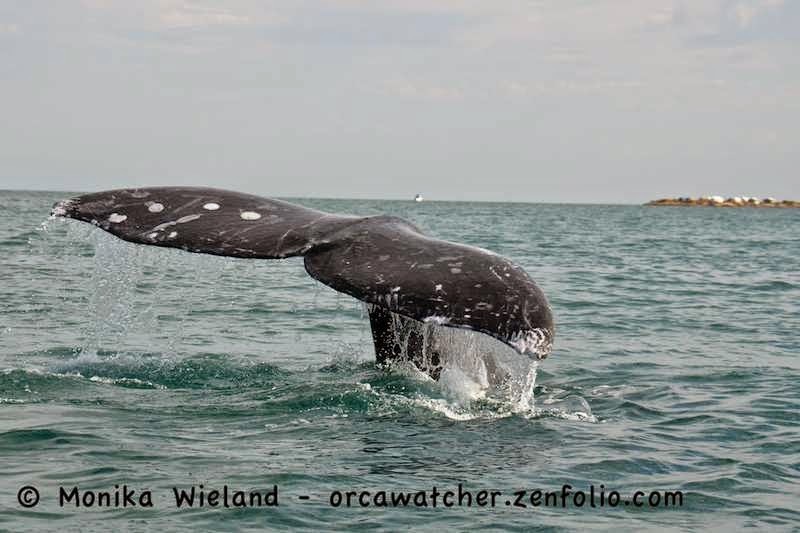 We were incredibly lucky to have friendly gray whales on each of our whale watch trips. These whales approach the boats and demonstrate a mutual curiosity about humans, allowing themselves to be touched and kissed. It's quite different from the 200 yards we have to keep from orcas in the San Juan Islands, but in such an isolated location it's been possible for this trustful relationship to blossom without harming either whales or people. 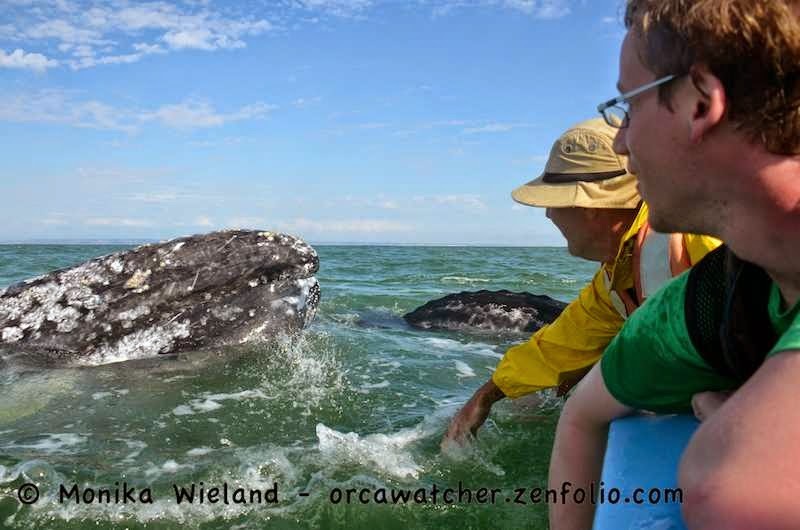 For their part, the whales are amazingly gentle and aware of their surroundings given that the moms are about twice the size of the pangas. 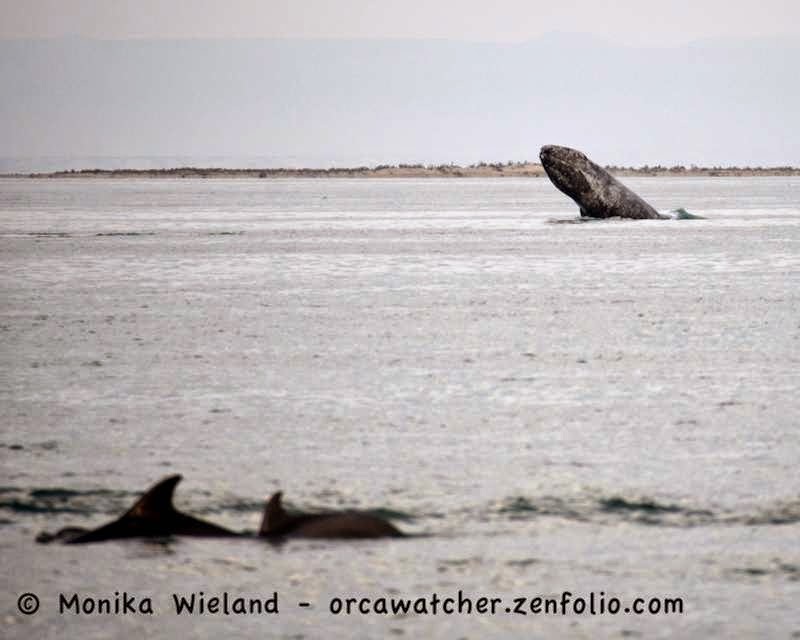 And the humans carefully regulate the interactions, limiting the number of boats that can be out there (no more than 16 in the lagoon at a time), how long each boat can be there (90 minutes per whale watch), and the hours whale-watching can happen (8 AM to 5 PM). That's all on top of making the majority of the lagoon a no whale watch zone. All the boats are run by the local fishermen and they self-police themselves with the help of a "sheriff" who monitors the boat activity every day. Here's me leaning over to kiss one of the calves - it sounds like a funny thing to do, but when you're there with them you can't help but do it! There just aren't words to describe what it's like to be that close to a whale - a whale that's checking you out, too! We even had a baby come up to the boat and open its mouth several times. 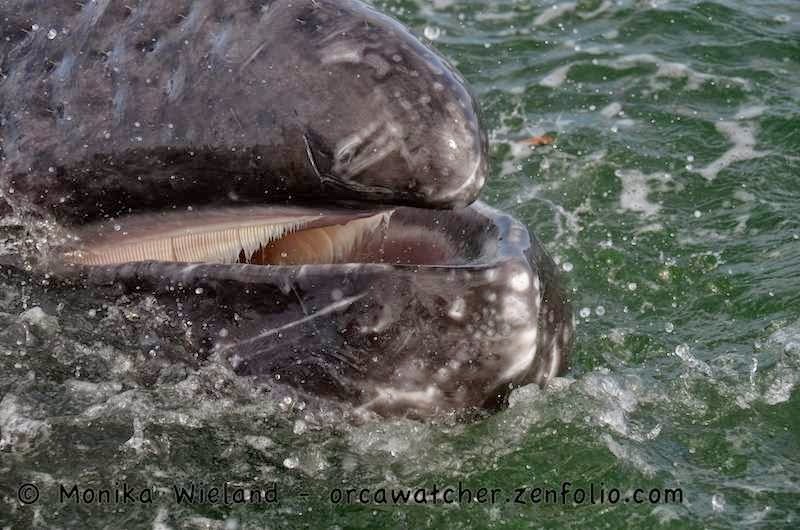 They seem to like to have their baleen touched. 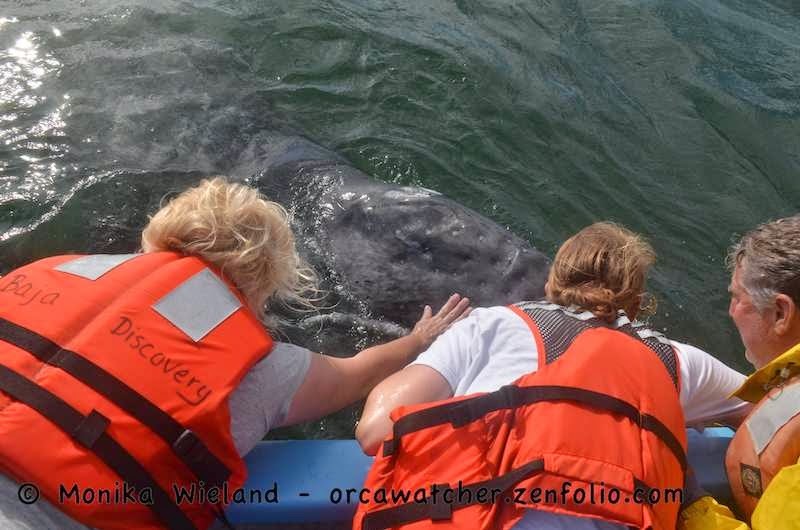 It's pretty unreal to put your hand inside the mouth of a wild whale, but I gently did it! The baleen was amazingly stiff and clean (though of course the babies haven't used it for scraping food off the bottom of the ocean yet). On the bird side of things, I only added one more year bird to the list on this day (March 18th), when I spotted a flock of semi-palmated plovers (128) while walking along the beach just before sunset. All these amazing sightings and photos, but we still had another whole full day to go!